Swapping motion for stillness. Chatter for calm. …Take more time away. Spend more time alone. Trade the speechifying for solitude, which no longer gets anything close to the veneration it’s due, not just in politics but across many walks of life. The calendar of a senior executive or public official is defined by meeting after meeting upon meeting. There’s no comparable premium on solitary pauses, on impregnable periods for contemplation, and a person who insists on them attracts a derogatory vocabulary: loner, loafer, recluse, aloof, eccentric, withdrawn. Cain’s book focuses on introverts, making the case that they have a kind of intellectual advantage. And their edge stems largely from greater amounts of solitude, from the degree to which they’ve swapped motion for stillness, chatter for calm. They’ve carved out space for reflection that’s sustained and deep. I’m on a conference call. The discussion is stretching and swirling in a loop. I can feel my patience growing thin. Or part of the creative process? Or is this a complete mess? Or is my lack of sleep clouding my judgment? I call up one of my favorite management books: QBQ by John Miller. John would suggest that I ask the Question Behind the Question? Why am I amped up? What have I done to contribute to the rudderless direction of this call? I think about that for a moment. Nah, can’t be me. Of course not. I let the debate go on. I listen in silently hoping the solve is coming. I turn to gnawing on a finger nail. Lean in? No. Lean Back. Yet the biggest problem in the business world is not too little but too much—too many distractions and interruptions, too many things done for the sake of form, and altogether too much busy-ness. The Dutch seem to believe that an excess of meetings is the biggest devourer of time: they talk of vergaderziekte, “meeting sickness”. However, a study last year…suggests that it is e-mails: it found that highly skilled office workers spend more than a quarter of each working day writing and responding to them. Which of these banes of modern business life is worse remains open to debate. But what is clear is that office workers are on a treadmill of pointless activity. Managers allow meetings to drag on for hours. Workers generate e-mails because it requires little effort and no thought. An entire management industry exists to spin the treadmill ever faster. 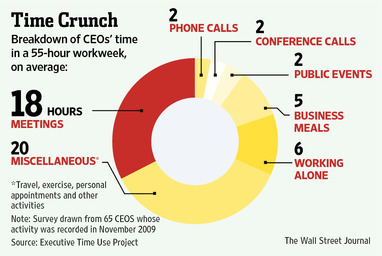 What do chief executives do all day? It really is what it seems: They spend about a third of their work time in meetings…18 hours of a 55-hour workweek in meetings, more than three hours on calls and five hours in business meals, on average…Working alone averaged just six hours weekly…CEOs say they pine for more solo time to think and strategize…(however) CEOs say that meetings are an important part of their job, helping them connect with managers and clients, but can be a waste of time if they aren’t run efficiently.